Your wedding dress is one of the single most exciting dresses you’ll ever choose to wear. Wearing it is a defining moment in your life and will be the golden moment in the museum of your stylish youth. Naturally, with all this pressure, finding one that is just so can turn into a quest much like finding the Holy Grail. We hear you. Instead of agonising over which one, begin with some smart research on what styles or clever little details make your fashion barometer rise. We look to our favourite all-white frocks from the S/S 16 designer collections that raised the pulses of the FROW and are set to spark a whole new domino effect of trends in the bridal world; from Proenza Schouler’s monochrome bows (the cool kind) to Céline’s alluring new neckline that redefines femininity. Scroll down to uncover the cutting-edge wedding dress trends and inspirations for a year of very chic brides! 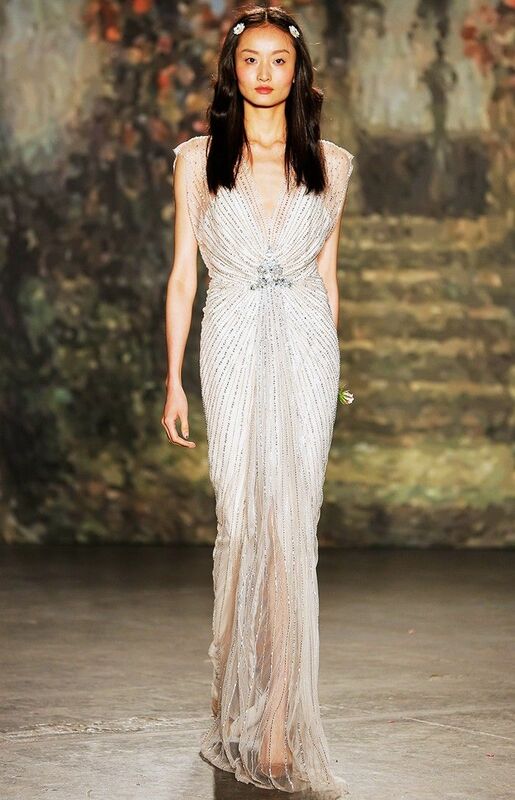 Catwalk Notes for Brides: To look instantly demure (rather than like a glitter ball) in head-to-toe sequins, plump for the Jenny Packham way: blush and skin-tone fabrics with peek-a-boo tulle sections create an enthereal look and create a pitch perfect base for heavy embroidery. Catwalk Notes for Brides: Lily Donaldson on the runway at Issa S/S 16 made a cool case for amplifying a long white gown with bright and bold heels. While blue satin court shoes (we're thinking of these Manolo Blahniks, naturally) are the natural departure from off-white shoes, we like the challenge this presents us with. Catwalk Notes for Brides: From the very edge of the shoulder bone and swooping down elegantly to the tip of the cleavage (with no bust on display, importantly), Pheobe Philo of Céline's new neckline is distinctive and highly evocative. If you're going down the haute couture route and having your wedding dress made by original design, this is certainly an of-the-moment neckline to consider. Catwalk Notes for Brides: Monochrome is the new way to go on your big day. Swap out pretty pink accents for glamorous, Andrey Hepburn–inspired black trims and deftly placed bows. Catwalk Notes for Brides: Flouncy frills and voluminous ruffles may make you think of those '80s wedding dresses that fashion would sooner wish to forget, but there's a legit way of adding megawatt fabric to your wedding dress without looking like an overzealous pudding. Sheer silk and organza are your new best friends—best worn on short sleeves like Temperley London's S/S 16 look. Catwalk Notes for Brides: How does one do feathers without looking like an extra in Sesame Street? Simple. Understated colours are best when going for exotic feather detailing. Reach for blush pinks, soft creams or pristine whites. A vintage brooch centerpiece is optional. And remember, less is certainly more. Catwalk Notes for Brides: The ladylike way to show a little leg on your wedding day without breaking too many style rules? Opt for a sheer section to your full skirt in the manner of Amanda Wakeley's striking evening gown. With silk-satin trimmings and two-tone pleats, this is a dress style that'll never loose its cool. Catwalk Notes for Brides: If your wedding day is during the winter, you've got to consider what you'll wear when dashing between the car and the venue. Dior has answered all of our bridal fashion prayers with this striking appliquéd dress coat that runs the risk of upstaging your dress. Catwalk Notes for Brides: The ruffled neckline is a powerful styling flourish to go for on your wedding day. You'll earn extra fashion points for incorporating ruffles in the same look too! Catwalk Notes for Brides: Strips of fabric and tassels are the microtrend du jour amongst the fash pack, so take this look down the aisle with long streaming bows or dangling elements to your gown for a futureproof look. Catwalk Notes for Brides: Now, onto the veil. Minimalists will rejoice at this little style trick: Make a headband out of a thick strip of veil and secure at the back with pins. Clever. Which tip is the most useful for your big day? Share in the comments below.